How does the mind work? How is data stored in the brain? How does the mental world connect with the physical world? The hybrid system developed in this book shows a radically new view on the brain. Briefly, in this model memory remains permanent by changing the homeostasis rebuilding the neuronal organelles. These transformations are approximately abstracted as all-or-none operations. Thus the computer-like neural systems become plausible biological models. This illustrated book shows how artificial animals with such brains learn invariant methods of behavior control from their repeated actions. These robots can make decisions in any circumstances and reason by analogy whenever possible. 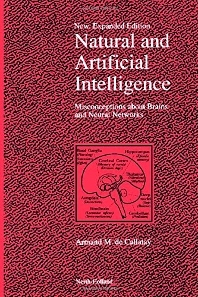 This new and expanded edition includes a prologue exploring the problems which have stopped the development of fully fledged brain models. The causes of these deadlocks are listed as potential misconceptions about brain principles, neural networks, nervous systems, robotics, programming and decision logic. How to Read the Book. Summary of the Expanded Sections. Summary of the Book (1986). PROLOGUE. Misconceptions about Brain Principles. Misconceptions about Neural Networks. Misconceptions about Brains. Misconceptions about Robot Controllers. Misconceptions about Programming. Misconceptions about Decision Logic. Summary. INTRODUCTION. Integration of existing theories. Main features of the model. Discussion of the main characteristics of the model. Rhythmic processing. Symbolic processing. Additive database. Hierarchy of integrated mechanisme. Self-programming method. Associated research areas. Revived hypotheses: The pure model and its real implementation. From the theory of knowledge to computer knowledge networks. To what extent can we understand the brain. HARDWARE. Computers compared with the brain. Logical impulse. Gate. Theoretical cell. Content Addressable Memory. Connectionnist hardware. Arithmetic logic unit (ALU). Finite State Machine. Information retrieval. An additive database: a memory which is never erased. Flow processor. Directed Network Processor Systems (DNPS). Silicon brain model. Bidirectional tree machines. Pattern Processors. RCAM specifications. RCAM design. DNPS design. SOFTWARE. Introduction to logic programming. Additive style of programming. Object oriented programming. Scope of identifiers. Prolog elements: program flow control. Evaluation. Inferences and problem resolutions. Parsing. Prolog interpreter. Prolog interpreter in DNPS architecture. Operating systm. The primacy of function in the model. ROBOTICS. Introduction. Regulation and control by conventional methods. Actuators. Device types in the robot controller. Model for a robot controller with perceptrons. Regulation with symbolic processors. Specialized stop commands after fast movements. Goal directed behavior. Perception. Classification. Review of classification problems. Feature extraction. Simulation of brain model classifier. Simulation of brain model classifier. Piaget's sensory motor scheme. Integration of the Piaget theory into my model. Piaget's development of the SMS. Coordination of vision and prehension. Stages or levels. THE NERVOUS SYSTEM. The nervous system: an overview. Neuron membranes and synapses. Neuron. Teh neural nucleus. Evolution of neural functions. Brain rhythms. Neuroanatomy. A BRAIN MODEL. Neural mapping of functional cortical collumns. State, intention and action. Adaptive learning of the subsequent intention. Effort/distraction choice. Hierarchies. Rewards, punishments and top decisions. The recognition memory. Short term memory. CONCLUSION. Appendix 1: Functional Cortical Column. Appendix 2: Comparison of Brain Models. Appendix 3: History of the Research. Postscript to the expanded edition. Preface of the first edition (1986). Abbreviations. Glossary. References. Subject index.